The holidays bring out the worst in people, but you don't have to let them bring out the Scrooge in you. The holidays tend bring out the worst in people. Whether it's being cut off by some jerk stealing your spot in the mall parking lot, having a relative pick apart your latest life choice or being subjected to a coworker's constant humble brag about finishing up her holiday shopping back in July, there's no shortage of not-so-festive scenarios that can leave your blood boiling this season. In holidays past, I dealt with jerks by muttering back responses were decidedly more naughty list than nice. But over the last year I've been working on employing more empathy toward people, and it has definitely elevated my tolerance level (not to mention lowered my blood pressure) — especially when it comes to the Scrooges in my life. Here are a few expert tips for cultivating empathy that will help you deal with the annoying cast of characters that inevitably show up during the most wonderful time of the year. Even if you've finished all your gift shopping like some kind of holiday unicorn, there's likely something that's causing you stress during the month of December, whether it's end-of-year deadlines at work, family obligations or a calendar full of holiday parties. Rachel Hershenberg, Ph.D., Assistant Professor of Psychiatry and Behavioral Sciences at Emory University, says that tapping into the stress you're personally feeling is a great tactic for having empathy toward the holiday meanies in your life. "If you’re running around feeling this way — stressed out, pressed for time, impatient — then the person who 'stole' your parking spot is likely feeling the exact same way," she says. Easier said than done, am I right? Intellectually, I know that the man who just cut in front of me in line didn't do it because I'm a woman and he feels entitled to treat me like a doormat. But crazed 'holiday me' thinks it's perfectly reasonable that this might be the case. "If someone is rude to you over the holidays, remind yourself that their behavior is way more a reflection of them than you," says explains Natalie Feinblatt, Psy.D, a licensed psychologist practicing in California. "They are acting out because of their inability to handle the situation better in the moment, not because of anything to do with you." The worst holiday season I ever experienced was one where I had just ended a long-term relationship. I had moved back home after college, didn't have a job and was staring a mountain of student loan debt in the face. Of course, looking back now, I know I didn't really have it that bad. But in the moment, it felt pretty bleak. When people act out, often their expectations are off kilter, and they seem to want or need more than what can be provided. 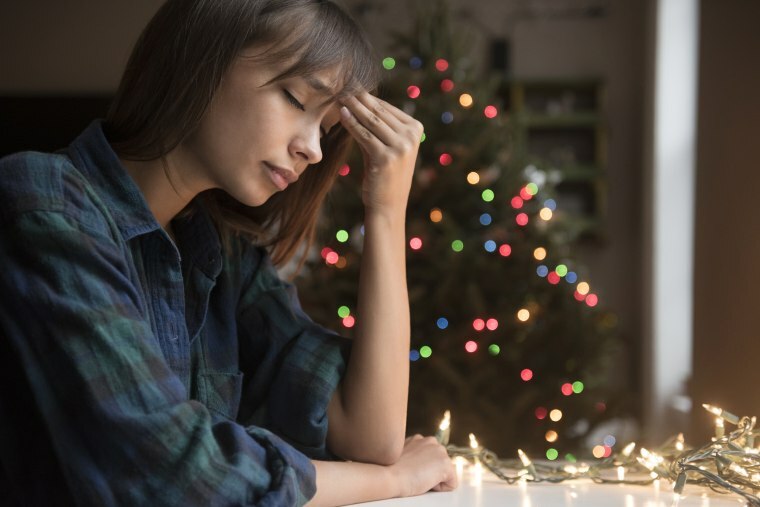 "Common triggers at the holidays include loss/breakups, financial stressors and unresolved family conflicts," says Dr. Kristen Lee, Ed.D., LICSW, behavioral science author and speaker. "Our ideals of what we think 'should be' and 'what is' are often at odds. When people act out, often their expectations are off kilter, and they seem to want or need more than what can be provided. When people display passive aggressive, aggressive or unruly behavior, there’s usually a lot behind their actions. It can help you take things less personally when you realize there are reasons behind someone’s challenging behavior." For the most part, my family members have been supportive of my life choices. But there's always one that judges me on how I should be spending my free time (i.e. frowning upon my penchant for sending Christmas cards featuring my cat and a bottle of Don Julio — a few of my favorite things). "Aunt Sally’s negativity is a ‘coping mechanism’ that she employs to get her through life," explains Dr. John Mayer, clinical psychologist at Doctor On Demand. "It may not be an effective coping mechanism, but understand that this is just the way she copes. Once you are empowered with this understanding, your empathy toward these relatives increases tremendously. When you understand people’s coping mechanisms you distance yourself from possibly getting into conflict with that person, as you will be leaving them to their coping mechanisms and not expecting them to be different!" As the saying goes, you can pick your friends, but you can't pick your family. So rather than letting Uncle Ted's opposing political views or Aunt Sally's judgments get to you, Hershenberg says focusing on the things you have in common will help you be more tolerant. "With friends, you choose them based on your views and whether they treat you in ways that feel consistently right," she says. "With family, that’s not always the case. So when possible, focus on what binds you together. Try to do activities during the party that are focused in the present. Tell stories of fond memories. Play with the little kids at the party and get involved in their antics. Work on being present and enjoying, to the extent that you can, this unique cast of characters that happens to be your family." And the same tactic can work for strangers. Yes, the pushy mother who rammed your cart in the grocery store is out of line. But you’re both in the same boat: braving the crowded stores to try and stock up on food and feeling stressed about cooking a holiday meal for your family — and she’s doing it with three kids hanging off her cart, so cut her some slack.